Multiple Italian retailers are putting up listings for Transformers: Robots In Disguise Surprise Easter Eggs (2018 Edition). Discover Transformers’ surprise for Easter. Many surprises await you to make children of all ages happy. In the 2017 Edition of the same line of Easter Eggs, random RID toys such as a Titan Guardian, a Legion Class figure and a One-Step Changer were included inside. @Nevermore ~ so, obviously i don't really understand the nuance of how Hasbro handles its products and divisions in Europe, is it possible this was something commissioned by the "local branch" or something along those lines? Like you said, very odd that it would be for one country. And it appears to contain a Botbots blind box figure, Authentics "Bravo" Bumblebee and Authentics "Alpha" Optimus Prime. Hasbro product code number C1750? This doesn't seem right. Thats an entirely different Hasbro product. Exactly how would one define \"perfect\" with this gift? That\'s a very subjective and debatable claim to make, more so when you\'ve actually handled a Kinder Egg toy and know their typical quality already. Appears to be exclusive to Italy. No worries, it was expected since we never got stuffs like these anyway he he he. Only tons of cheap RID pencils, watches, erasers, notebooks, etc. It's strange we got so much RID merchandising, even more than TLK or any other series. I would love to see this in my country. No lie, at first I thought that egg poking out the side was more NOTRAB mspaint shenanigans. So it's a mega-Kinder-Surprise? Interesting. I guess it shows how little the one-step changers sell, they have to use blindbag techniques to get RID of them… pun intended. well, not really, this is 100% plastic, but last year there was a mega Kinder surprise for Easter. 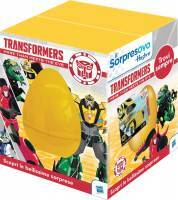 A giant plastic egg full of one-step changers? Egg-selent! How egg-siting! It’s a shell of an idea. I’d better get cracking and buy myself one before they all get poached. I can probably go on an egg-spadition to the shops on Fry-day and have a look. Hope I don’t have to shell out to much cash. Does it come with a M-egg-atron do you think? Nah, I’m only yoking. it is the exact same thing, for the TF Prime time. SSSHHHH!!! Don't spoil the surprise! It's odd that Hasbro would produce official packaging exclusively for one country. Wait, so it's just a plastic egg with a one-step changer inside? Cheap toy for Easter I assume.